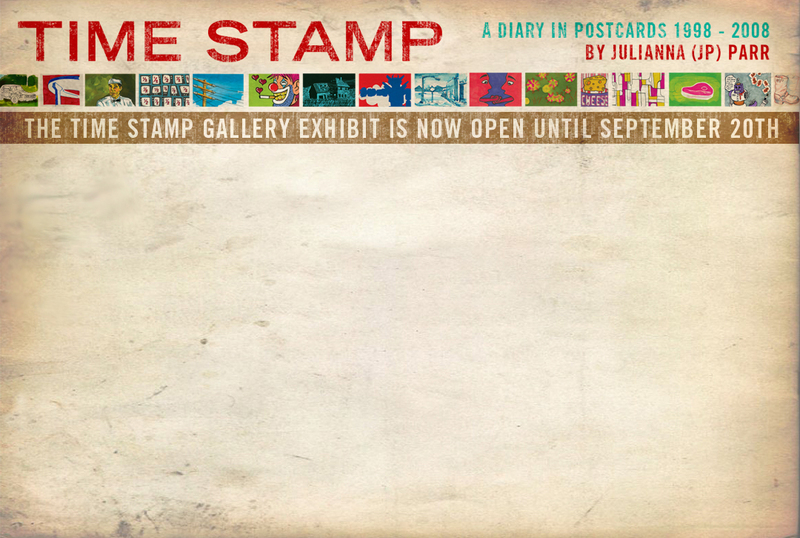 Showcased at the Gay & Lesbian Center Village’s Advocate Gallery from August 7th to September 20th, 2008 will be "Time Stamp: A Diary of Postcards 1998 - 2008 by Julianna Parr." "Time Stamp" will exhibit over 1,000 postcard paintings and drawings that span a timeline of 10 years, and consist of private personal works by Parr that have never been seen by the general public. From 1998 to the present, Parr has set herself the task of creating one postcard a day. This roadmap of human experience ranges widely in emotional substance, from light-hearted and colorful pieces about things like nursery rhymes, bicycle rides and cupcakes to deeper and darker contemplations of subjects such as death and disease. Also recorded are anecdotes of love lost and found, a variety of lesbian and gay issues and an appreciation of everyday life expressed in all manner of abstracts, portraits, landscapes and errant doodles. Julianna (JP) Parr resides in Echo Park, California, where she makes her living as a freelance artist. She is also the Los Angeles Craft Captain, holding CraftNight at Akbar in Silverlake every Wednesday from 9 to midnight. She is also Head Candycorn of Gothtober.com an online time-released countdown to Halloween featuring the work of 31 featured artists. As one might expect, the visual accumulation of making one postcard a day eventually adds up to an immense body of work. There will be extra added features of this show, encouraging visitors to not only look at and inspect Parr's work, but be encouraged to make some of their own. "One of the underlying themes of this show is that I did all of this, and you can too" says Parr. With this exhibit, Parr hopes that visitors will be reminded that art is not a spectator sport, and that even the smallest works can make big statements.